The temple was built by Shivasimha Malla honoring the Mallas' family deity, Degutale. It resembles Taleju's shrine but with a tower-like base in place of the stepped platform. The worship of Degutale has its origins in a nature cult, the images being pieces of rock which the Newaris set up and worshipped. Dedicated to Shiva the large three-storied Manju Deval on its unusually high stepped base seems to dominate Durbar Square. 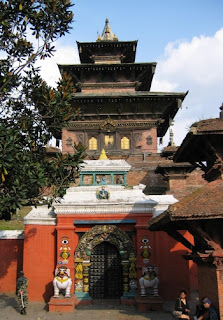 It was built in 1692 by the mother of Bhupatindra Malla of Bhaktapur. Inside the temple there is a Shiva lingam. The small shikhara (temple tower in the North Indian style) at the foot of the steps honors Kam Dev, Shiva's shakti. The house of the Living Goddess, the Kumari Bahal looks like the monastery that was constructed in 1757 by Jaya Prakash Malla. Inside it lives the young girl who is selected to be the town's living goddess, until she reaches her first puberty and reverts to being a normal mortal.